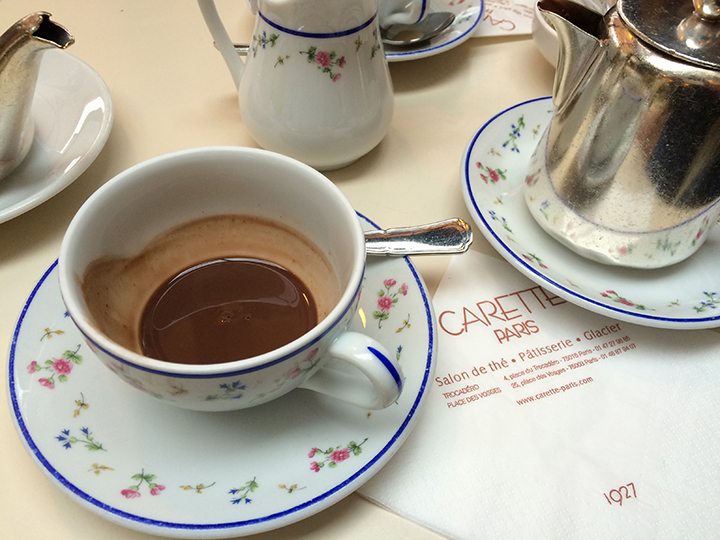 One of the best things about visiting Paris in the winter was the chocolat chaud. The French version of hot chocolate is equal parts thick, rich and smooth, and just the right amount of sweet. Such warm chocolate-based beverages were once considered a luxury among European nobility, served in the highest courts of 16th century Europe. Today chocolat chaud can be enjoyed by all at cafes throughout Paris. You can also find other variations across Europe from Spain (often served with churros for dipping as breakfast or a late-night snack) to Belgium (usually a cup of steaming white milk and a small bowl of bittersweet chocolate chips to dissolve), and in other countries throughout the world. The good news is you don’t have to travel far to indulge in this borderline sinful treat. Chocolat chaud is actually EXTREMELY easy to make as long as you have high-quality cholate (the better the chocolate, the better the result). You can also serve it with assorted toppings like homemade whipped cream, marshmallows, peppermint sticks, wafer cookies and spirits like I recently did for a French-inspired New Year’s Eve party. Heat the milk in a medium-sized saucepan, making sure it does not boil or else it will scald. Add brown sugar and whisk mixture one more time. Remove from heat and serve warm in small cups.